Hello. My name is Emma, and today we are going to learn some work expressions, okay? 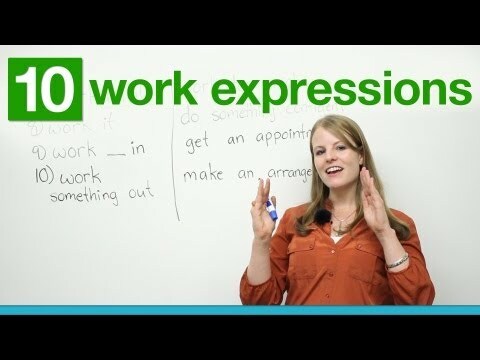 So these expressions don't necessarily actually have to do with work, but they're expressions that use the word "work". So today, I will teach you ten new expressions. Let's get started. Expression No. 1: "overworked". What does it mean to be "overworked"? If you are "overworked", it means you have too much work, okay? So this is not a happy situation. So you might tell your boss, "Listen. I feel a little overworked." Maybe you complain to your friends on the phone, "Work is so hard. I'm overworked. There's no staff. It's all me. I work, work, work. I'm overworked." So "over" usually means, like, "more". So that's a hint, "overworked". One thing about all of these expressions: Pay careful attention to the preposition because with work expressions, a change in preposition can completely change the meaning of the expression. So that is "overworked". I hope none of you are overworked, and I hope none of you are "underpaid", meaning you're not getting enough money. Our next expression is "dirty work". I really like this expression. So what is "dirty work"? Well, "dirty" is the opposite of "clean", okay? So "dirty" is "no clean" -- "not clean". "Dirty work" is work that is not fun work. No one wants to do dirty work, okay? So it's unpleasant -- see the sad face? -- work. What is an example of dirty work? Well, maybe you work at a company, and maybe there's a co-worker, or maybe you have some staff, and someone wants you to "fire" that staff, meaning someone is not happy with this person's work, so they want this person to be "fired". Instead of them saying "You can't work here now", they will tell you to fire this person. So it's a job you don't want to do, essentially. There are many examples of "dirty work", but what it really is, is a job no one wants to do. Clean toilets might be dirty work. Maybe your friend is having a party, and there're a lot of people invited, and the party has to be cancelled. Maybe the dirty work is you have to tell everyone the party is cancelled. So it's work you don't want to do. Example No. 3: "get worked up". What does it mean to "get worked up"? It means you get very, very angry or very upset. It means you get very emotional. When you get worked up, you get very angry or emotional. So "get worked up". An example of that: Maybe it's the night before your big test, and you haven't studied, and you're very stressed out, and you start to cry, and you say, "I'm not going to pass this test. My life is ruined. I'll never get into a university. Everything's horrible." That's you getting worked up, okay? Because chances are you will do all right on your test, and you will get into university, and even if you don't, you can try again at a later time. No. 4: "work out". So "work out" has two meanings. The first meaning is "exercise", okay? Do any of you guys work out? I think working out is fun. So it just means, you know, if you like to run, if you like to lift weights. Maybe you like to play basketball -- these are "workouts"; it's exercise to become healthy. The second meaning of "work out" is when you "work something out", you find a solution to that. So for example, maybe you have a math problem, maybe two times two, two times two: You have to "work it out". That one is a little easy, but maybe you have calculus.